Seismic isolation is the prominent seismic protection technology for building structures, bridges and other non-building structures. It aims to significantly, or in many cases totally, reducing structural/nonstructural seismic vulnerability under severe earthquake ground motions. Seismic isolation is implemented with isolation devices of two basic types: rubber bearings with lead core, and friction pendulum devices. Steel-based friction pendulum devices are gaining increasing popularity over rubber isolators and are being widely used in several applications worldwide. This is mainly due to the versatility in design and production, and their easier implementation in practice. The variability of seismic demands during seismic response is much less in friction pendulum devices. Further, torsional eccentricity imposed by the distribution of friction pendulum devices along the isolation interface is less significant compared to the rubber devices, and hence their re-centering capacity is better. The main focus of the proposed project is to improve friction pendulum isolation devices by imposing variable friction properties along the sliding surfaces. Although there are several theoretical studies in literature on the theory and analysis of variable friction devices, there is no developed technology yet. The variable friction devices that will be developed within the scope of the proposed project will be designed and produced by the industrial partner. Within the scope of the SERA project, we intend to do both component testing of the developed variable friction devices in the dynamic test press, and conduct shake table tests on a single story structural frame system which is base isolated with the variable friction devices. We will observe the dynamic response of the isolated system under uniaxial seismic excitation as well as inherently varying axial loads on the variable friction devices. We will develop an improved definition of ground motion intensity measures (IMs), particularly in near-fault conditions, and corresponding hazard-compatible record selection procedures for friction based isolation devices. 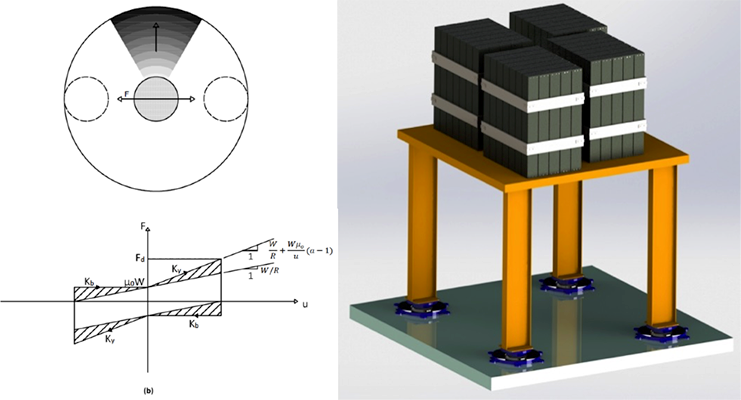 Finally, we will calibrate the developed numerical models with the test results for predicting the isolator and system response accurately, and then, based on a larger analytical study (i.e., simulation-based) propose design procedures for structures base isolated with variable friction devices.